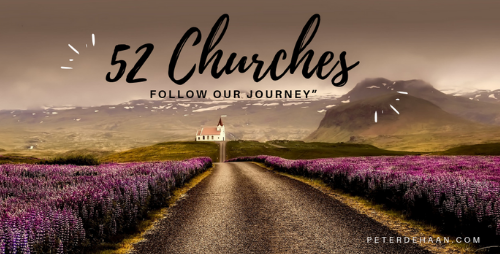 The first of fifty-two churches is a small Baptist-affiliated assembly. With forty or so normally in attendance, this Sunday has only seventeen. The service is not unlike churches my wife attended in her youth, so she feels comfortable and is familiar with their format even though it now feels quite dated. The people are friendly and—despite a bit of awkwardness when the pastor asks “first-time visitors” to raise their hands—I feel a contentment, a peace perhaps best attributed to God’s presence. There’s nothing remarkable about the service—a few old-time hymns with piano accompaniment, sharing prayer requests, an offering, a message, and a low-key alter call—but the people make the difference. They’re comfortable with each other, liking and accepting one another. There’s no pretense in their actions or words, just nice folks who are real. It’s like family, good family, albeit an eclectic one. The hour and a half service is mostly preaching, with reoccurring themes of Jesus, faith, and heaven. Our future in heaven is also a theme of several of the hymns. Afterwards, the people linger to chat; no one rushes out. Though our stomachs tell us it’s past time to eat, we tarry as well. Many sincerely thank us for visiting and invite us to come again but do so without being pushy. They’re a friendly church with a homey feel.